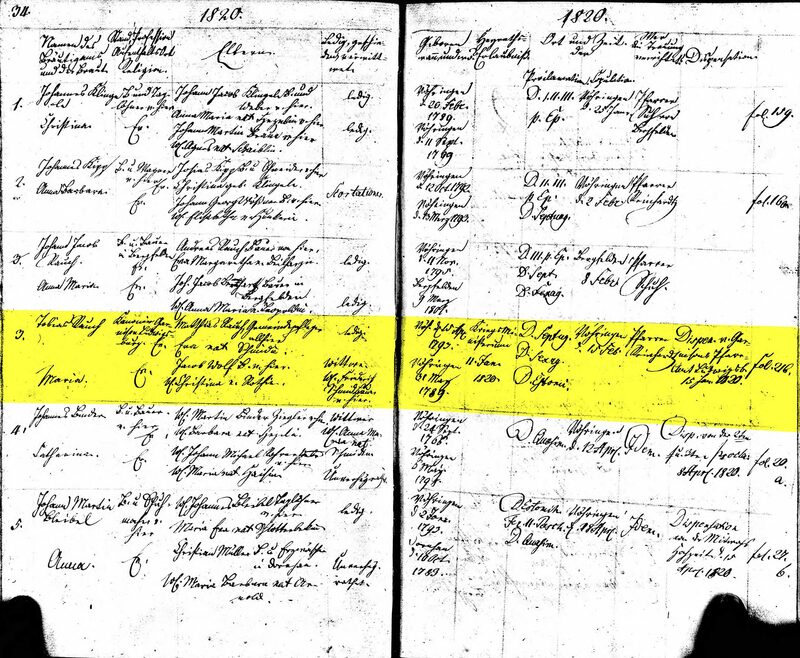 UPDATED 02/26/2017: Ancestry.com has recently added a large collection of transcribed Württemberg parish registers that include Vöhringen. Reading the registers prior to this was extremely difficult, especially if you didn't know exactly what you were looking for and when. 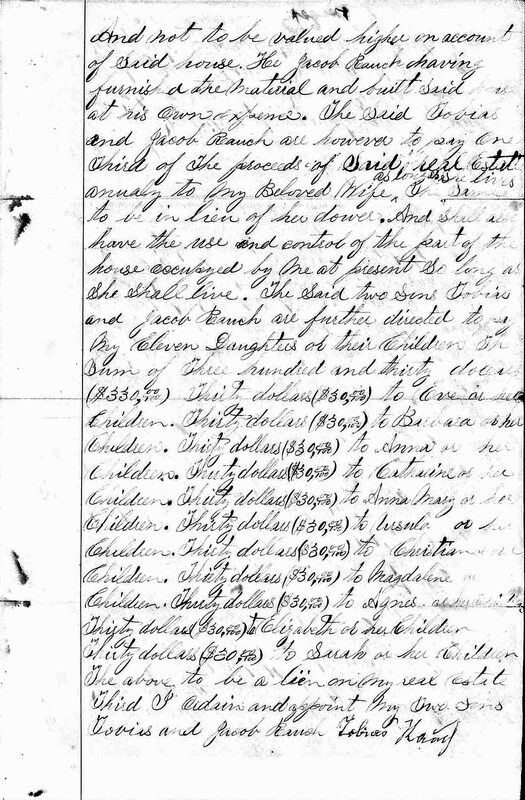 But now, because of the newly transcribed registers I have been able to do more detailed research into the family of Tobias Rauch and the tales they passed down. The story below has been updated to reflect that. 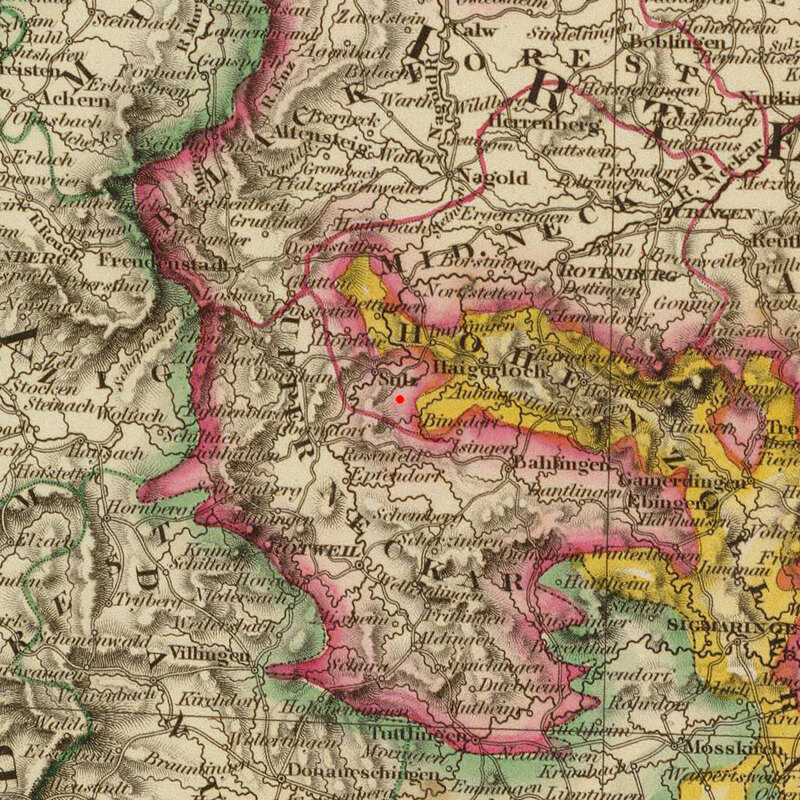 Named after his maternal grandfather, Tobias Rauch was born and baptized on the 15 April 1793 to parents Matthias Rauch and Eva Schmid or Schmidt.1, 12, L They lived in Vöhringen am Neckar, in the administrative district (or county) of Sulz in the independent state Württemberg,2 although the region has not been know by that name since the formation of Germany and first world war. The area is now known as Vöhringen, Rottweil, Baden-Württemberg, Germany. From what I can ascertain, Tobias, son of a farmer, seemed to grow up a part of a fairly prominent family in Vöhringen where family stories vaguely state he was trained in "the arts".E As he grows up, he appears to have been fairly active in the community and supposedly achieved the title of Bürgomaster (Mayor). We've been able to identify that Tobias was raised with 6 brothers (Johan Martin, Johannes, Andreas, Johan Jacob, Friedrich & Mathias) and 6 sisters (Ursula, Maria Magdalena, Anna Barbara, Anna Maria, Eva & Eva), and that he was his parents eldest child. Two of his brothers and two of his sisters did not survive to adulthood. 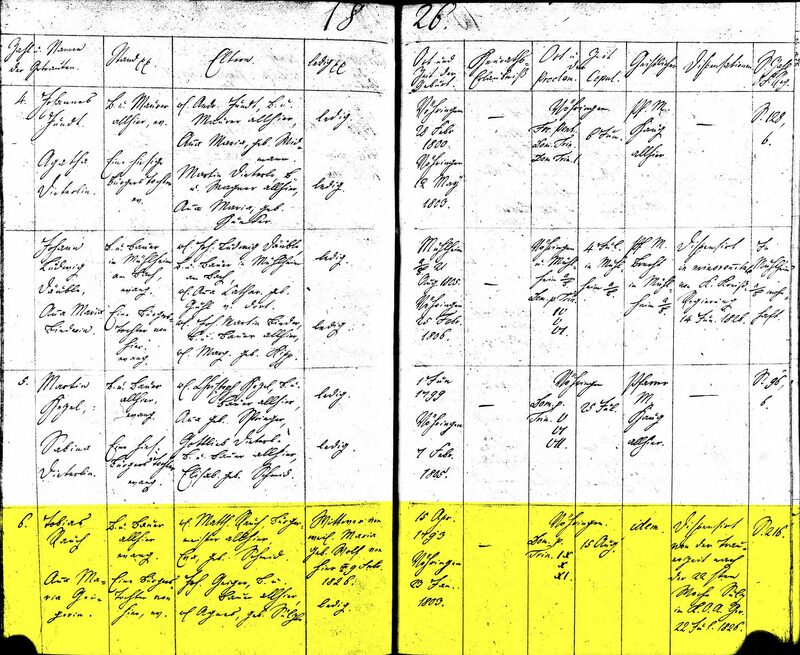 Tobias married widow Maria Wolf on the 30 Jan 1820 in Vöhringen.1, F Entering into the marriage, Maria brought 3 daughters from her previous marriage. Tobias & Maria would add to this family with the birth of three daughters of their own. The first, Eva, came 6 months later on 19 July 1820, followed by Anna Barbara in 1823 and Anna in 1826. 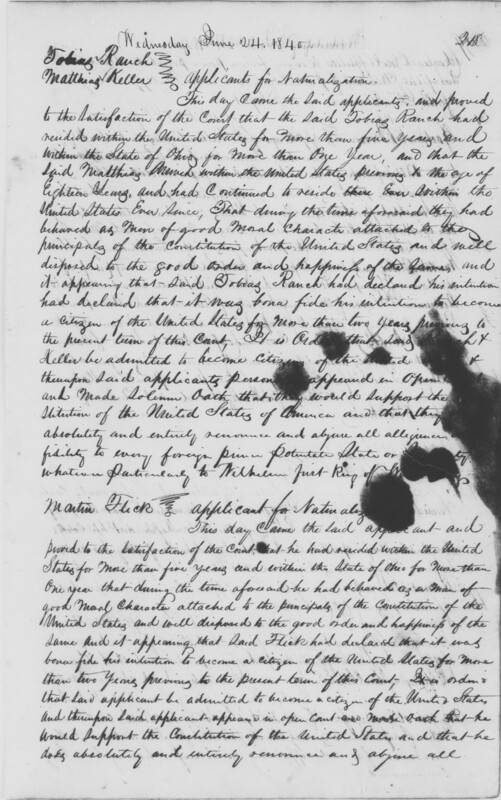 The first record I've discovered of Tobias in America places him in Medina County, Ohio on the 07 Nov 1836 where he is at the Court of Common Pleas at the Medina County Courthouse making his Declaration of Intent to Naturalize in front of county judge Benjamin Lindsley & the Grand Jury. 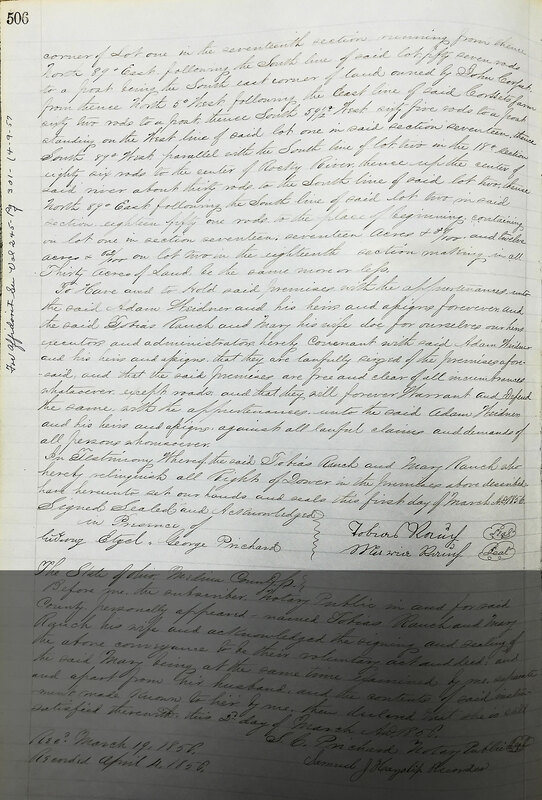 Two years later, on the 10 July 1838, Tobias purchased 30 acres in Liverpool Township, Medina, Ohio from John Cosset for $170 (parts of sections 17 & 18; The property transaction was recorded on county books on 17 Jan 1839). 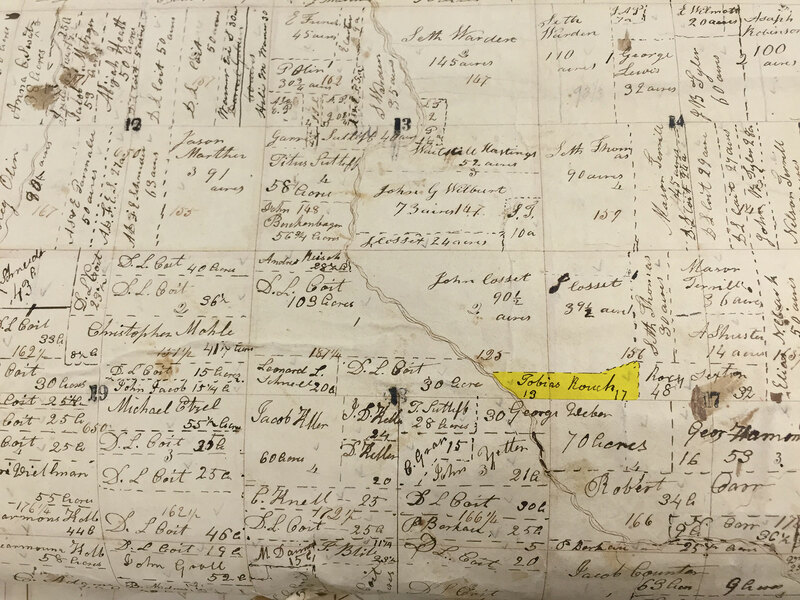 After their final child, Sarah, who was born in 1850, the family relocated from Medina county to Otter Creek in Linn County, Iowa. 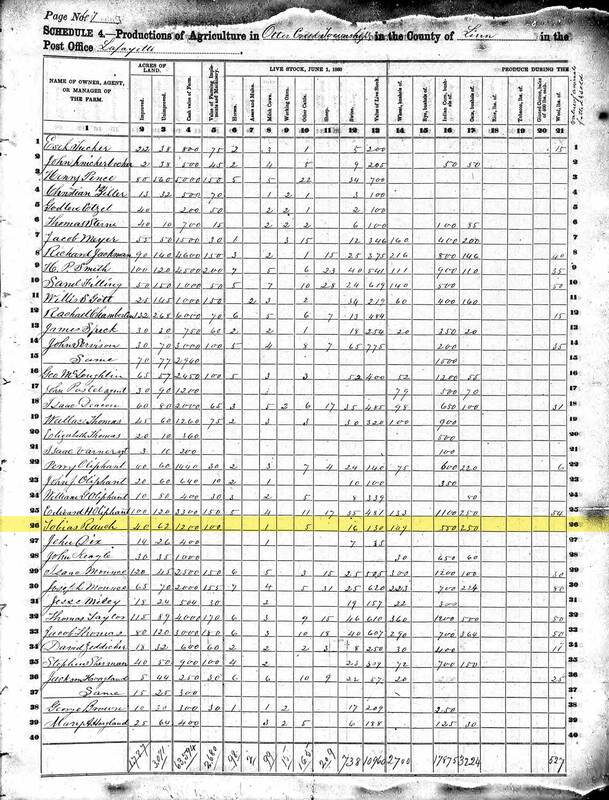 Their daughter Catherine had married a local farmer name Levi Schnell, who was a widower with 4 children. When the time came to leave, Catherine and Levi stayed in Liverpool Township, but it looks as though three of Levi's four children went along for the ride with Tobias. 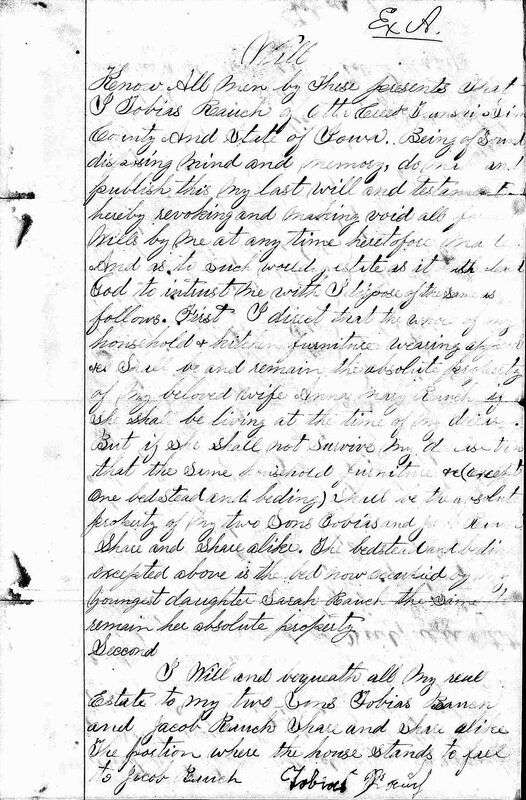 Levi's eldest son Lewis would live with Mary Anna (Rauch) and her husband Andrew Steinagle, but the 2 girls Mary and Elizabeth seemed to eventually continue west to Colorado. Christina Rauch, abt 1833 – ? A Tobias' obituary contains a few errors. First the obituary states that he died on the 19 May. This is a misprint or transcription error that is contradicted later in the obituary when his burial was listed on the 12th. His headstone confirms the 10th. 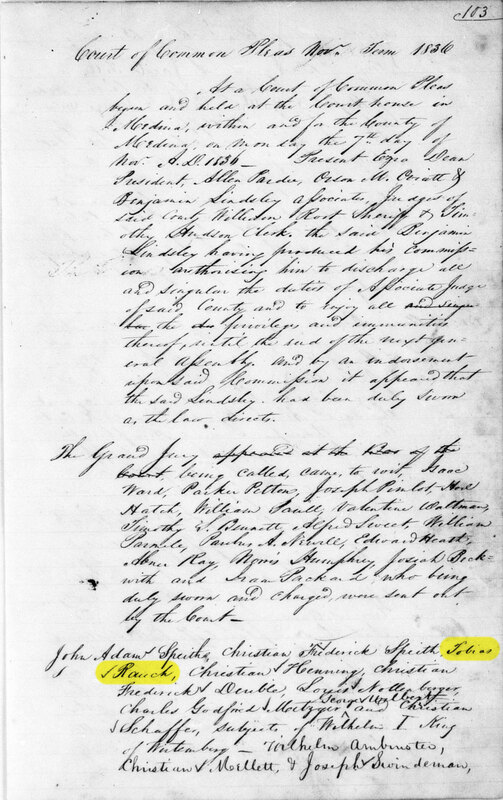 Also, there has been no evidence that the family ever lived in Columbiana county (east of Columbus along PA border) and having it change to Summit county is incorrect, Summit was formed in part from Medina County... Liverpool Township, where they lived is in Medina county but on the opposite end of the county from the area that was converted to Summit county. The only thing close was Columbia Township, which bordered Liverpool to the north and that was in Lorain county. 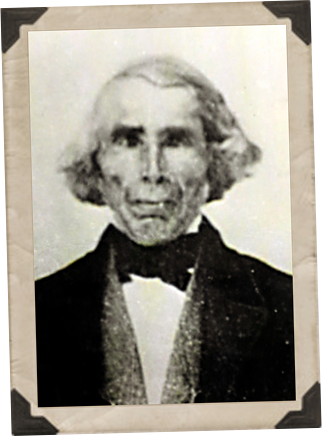 B Before arriving in Otter Creek and becoming a noted methodist, Tobias was noted as being a German Lutheran. F Maria Wolf's first husband Friderich Schmid died on 18 Dec 1818 and left her 3 daughters: Anna Maria (b.9 Dec 1809), Margaretha (b.24 Oct 1811), and Christina (b.19 Sep 1813). 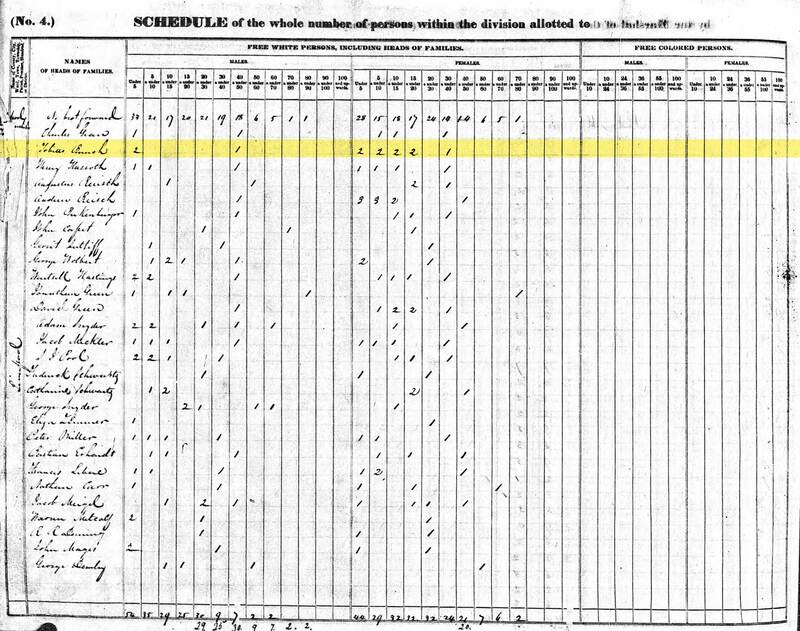 G Tobias' wife Anna Maria Geiger supposedly had a family of brothers and a sister Christina who all died in Germany. Christina is believed to have died with a small estate to her name. 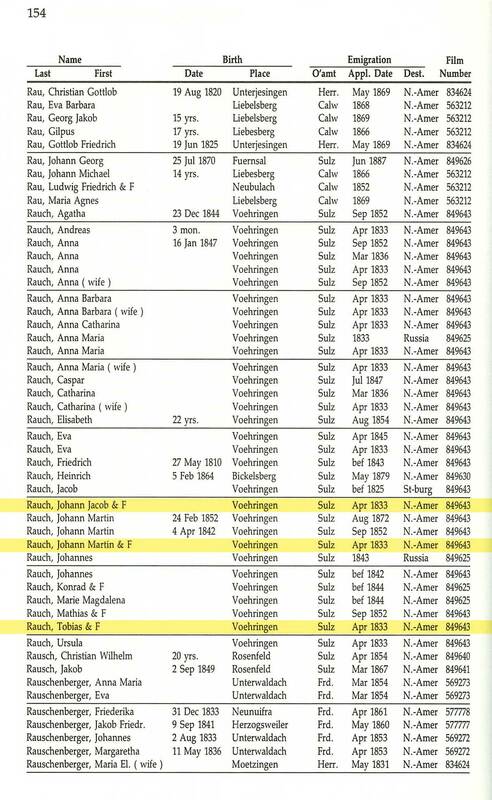 J There is a belief that Tobias' brothers Matthew & Martin were possibly 1/2 brothers, however baptism records do not substantiate this claim as Matthias & Eva are listed as both of their parents. 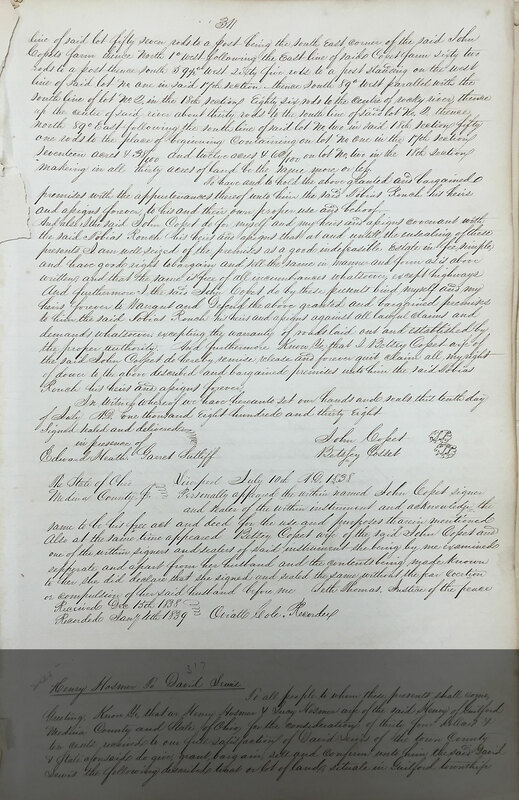 K Stories say Tobias' step-children from his 1st wife Maria were old enough when the family decided to immigrate to America that they did not join the rest of the Rauchs on the voyage across the ocean... This family story is 100% true. 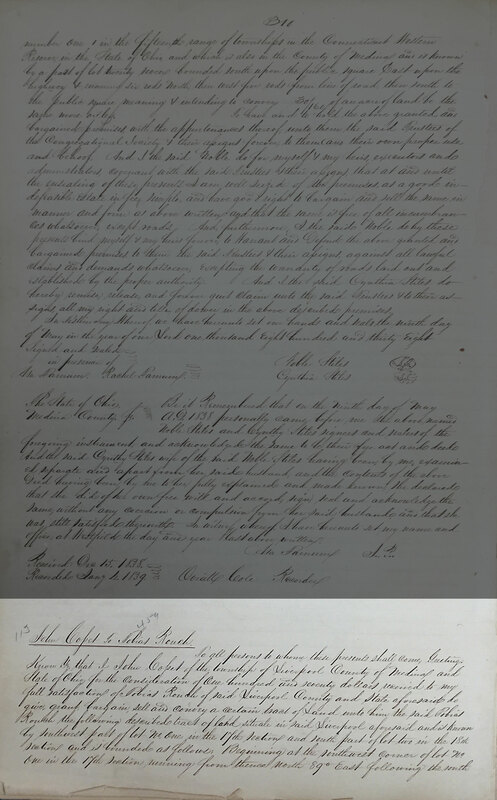 Anna Maria and Margaretha had already married by 1833 when Tobias left for America, and Christina was 20 years old and would marry the following year. 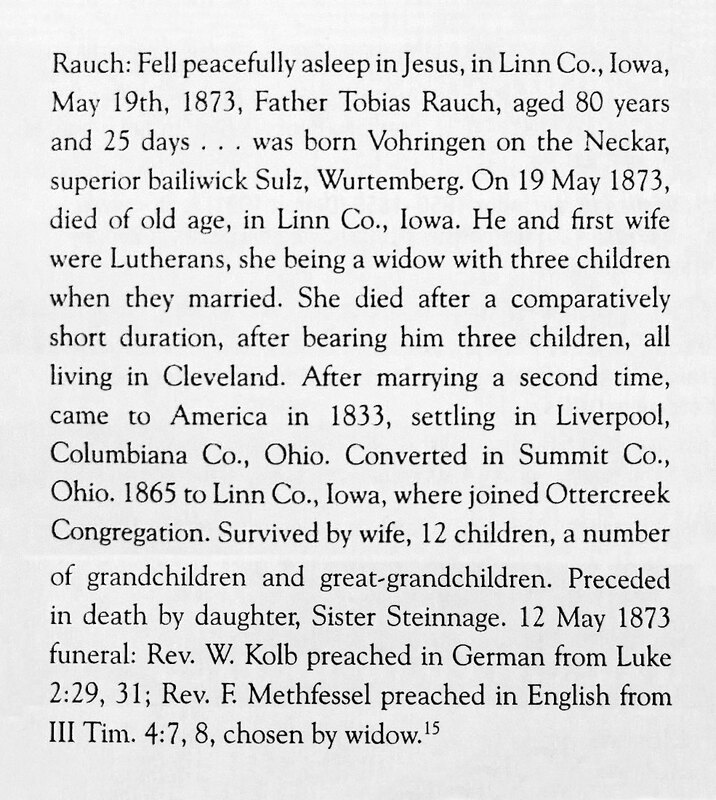 L The short length of time between Tobias selling his property in Medina, Ohio and purchasing in Linn, Iowa all but proves that the Rauch family took a train out west to Iowa. The railroad was completed in Iowa about 10 years prior. 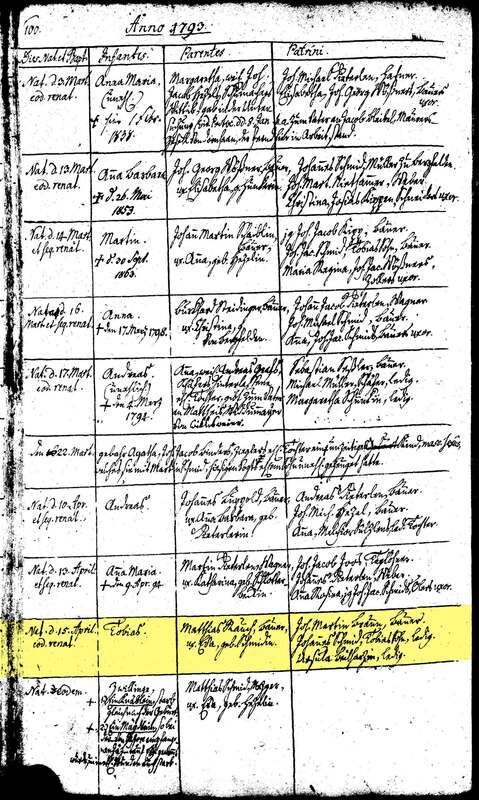 M While a number of trees name Tobias' mother as Eva Schmidin due to how it's written and transcribed on Tobias' baptism record, the vast majority of Vohringen church records mention the family name list it as Schmid. A name that would nowadays be commonly seen as Schmidt... I am currently unfamiliar with why but it appears a German custom of some kind to sometimes add an "in" ending on a woman's name. 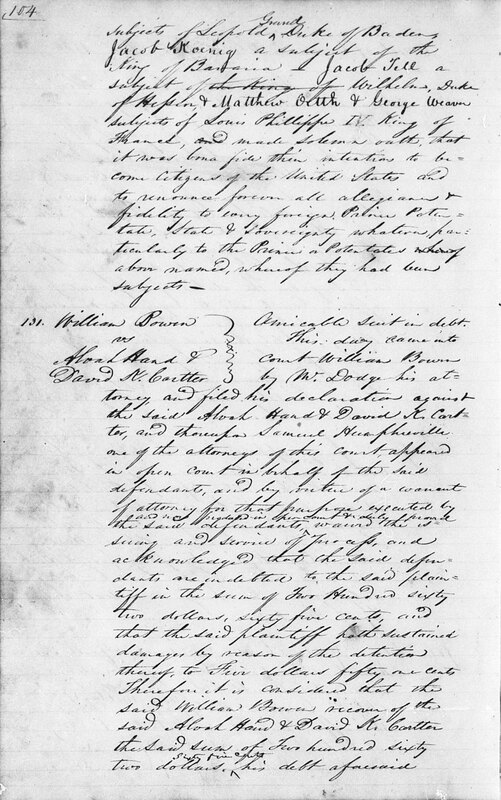 N Jacob immigrated to Wayne County, Ohio with his wife Anna Barbara and daughter Eva. The family would settled outside of Wooster in Chester Township. 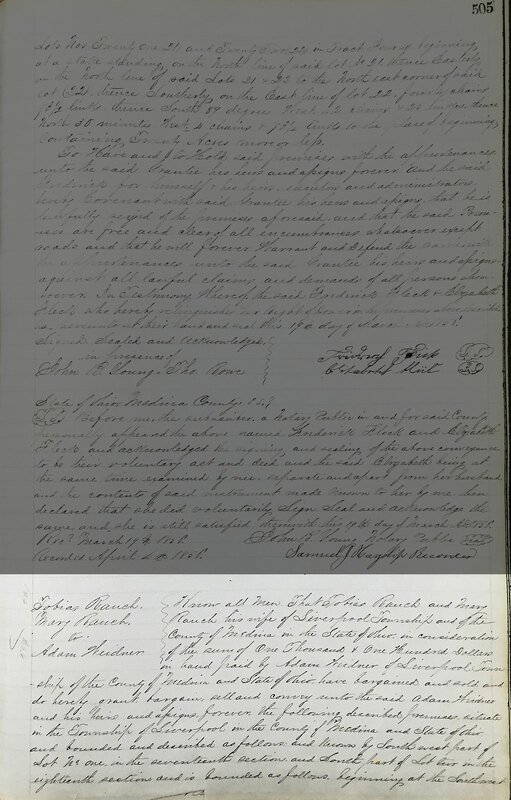 Eva married Joseph Ritter and moved to Steuben County, IN. 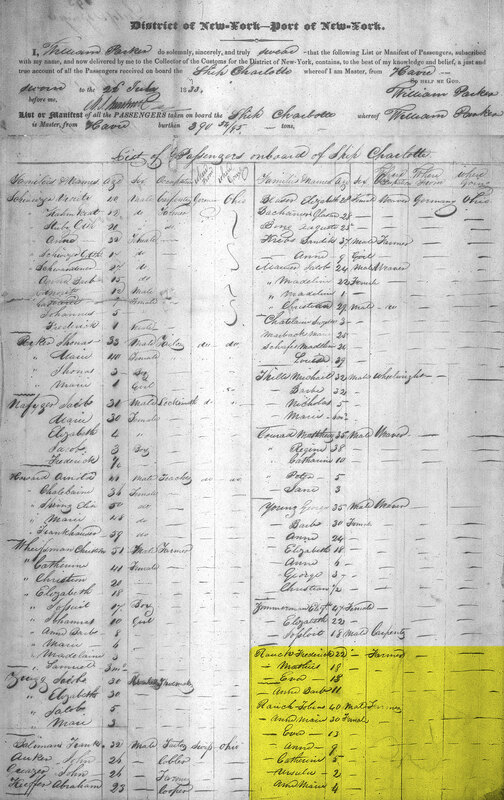 Anna Barbara passed away sometime before 1838 when Jacob remarried Mary "Polly" Henninger (and by complete coincidence, married into the other side of my family tree). The couple had 2 daughters together Sarah (b.1842) and Harriet (b.1850). 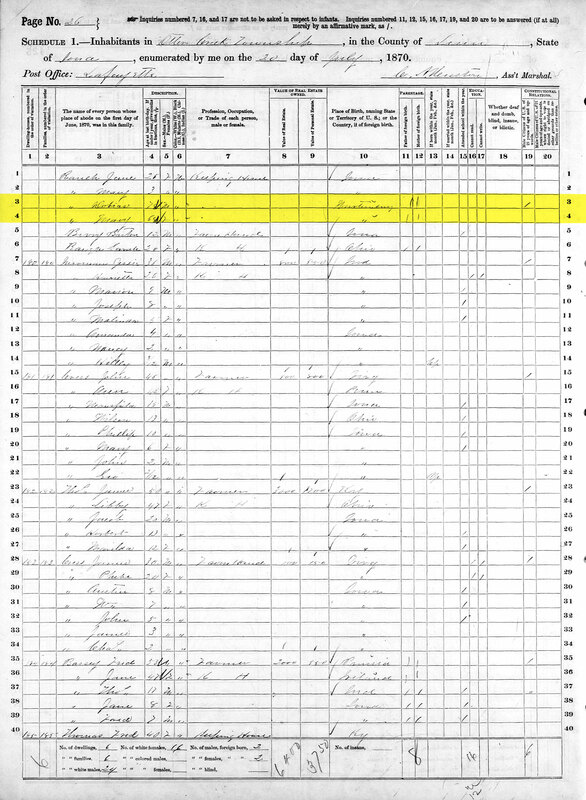 Jacob died 30 Dec 1880 in Chester Township. He was never noted to have a son. 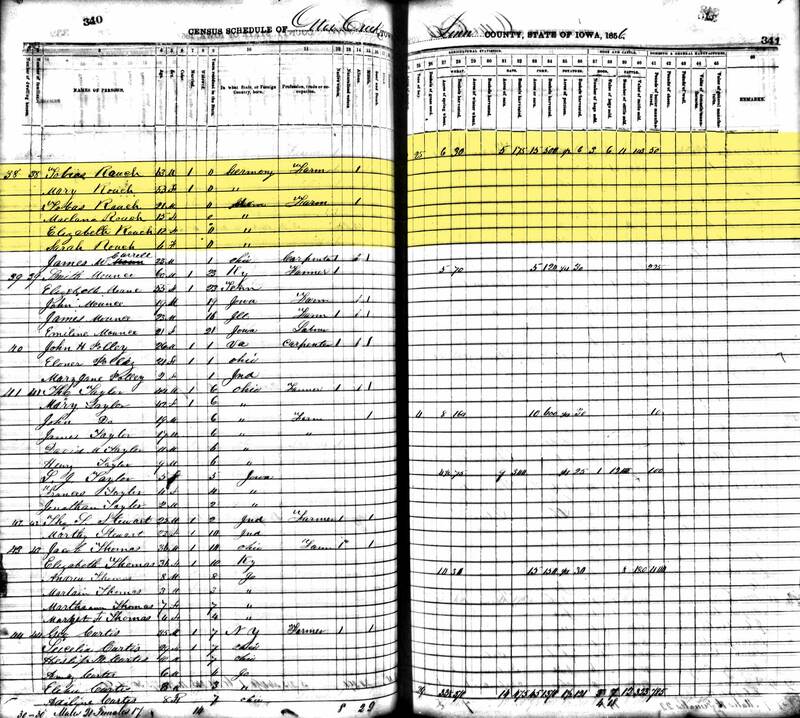 O The Three daughters from Tobias' marriage to Maria Wolf immigrated to America with the rest of the family and settled down in the Cleveland area (Cuyahoga County). They did not follow the Rauchs to Iowa. 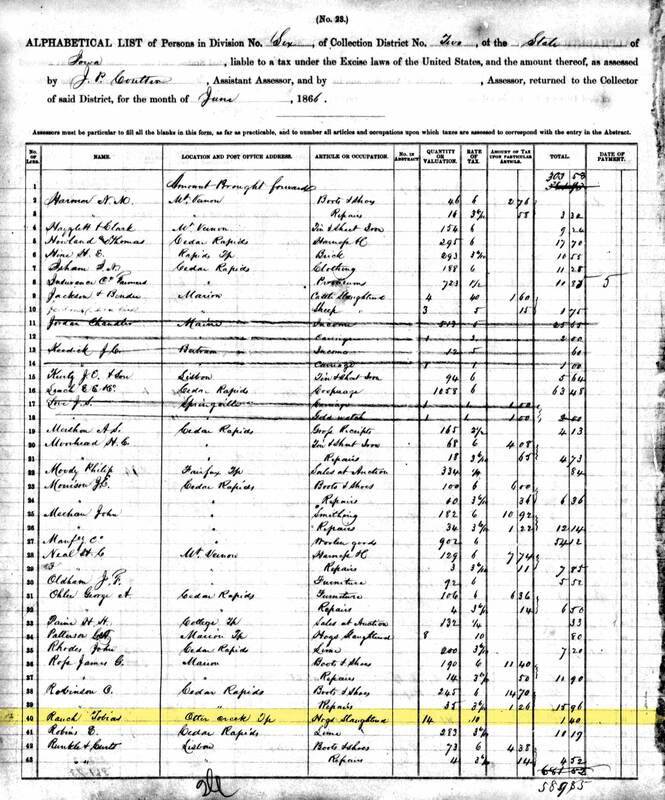 Eve/Eva married Walter Dalgleish in Cleveland, Barbara married Diebold Mallo in Brooklyn (Heights), and Anna married Berend Venderink in Cleveland. Was Tobias really a burgomeister / mayor in his community (or anyone in the immediate Rauch family)? 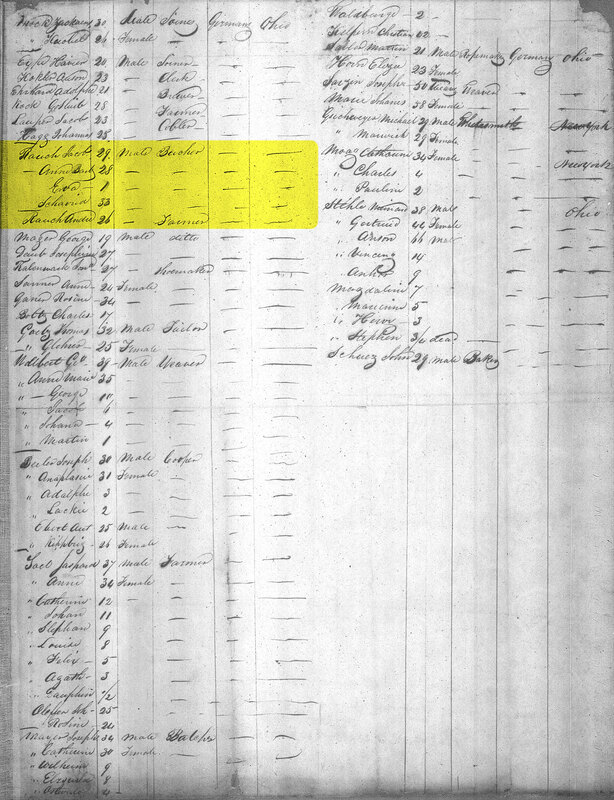 2 "New York, Passenger Lists, 1820-1891," database with images, FamilySearch (https://familysearch.org/pal:/MM9.1.1/QVPX-PM7Z : accessed 3 July 2015), Tobias Rauch, 1833; citing NARA microfilm publication M237 (Washington, D.C.: National Archives and Records Administration, n.d.); FHL microfilm. 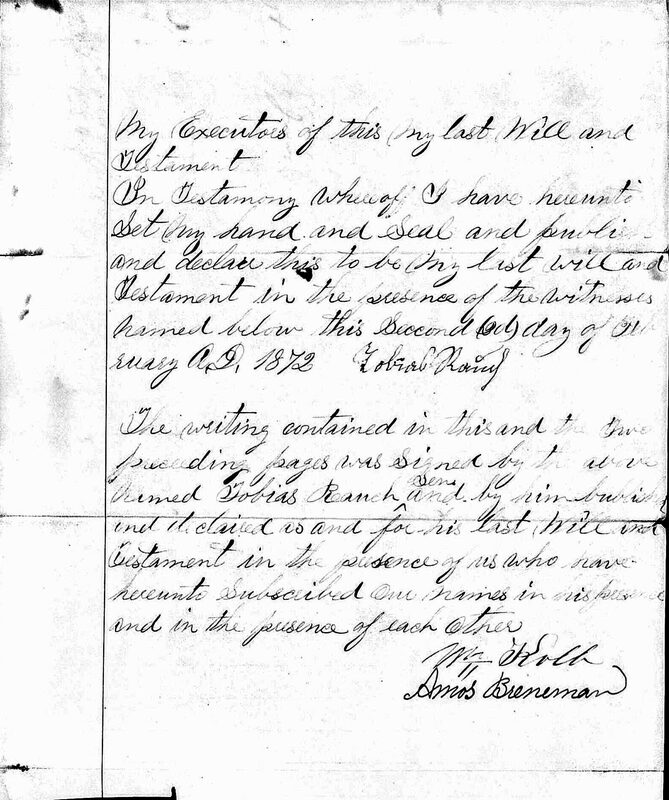 3 "United States Census, 1840," database with images, FamilySearch (https://familysearch.org/ark:/61903/1:1:XHYK-ZTX : accessed 3 July 2015), Tobias Bunch, Liverpool, Medina, Ohio; citing p. 264, NARA microfilm publication M704, (Washington D.C.: National Archives and Records Administration, n.d.), roll 412; FHL microfilm 20,171. 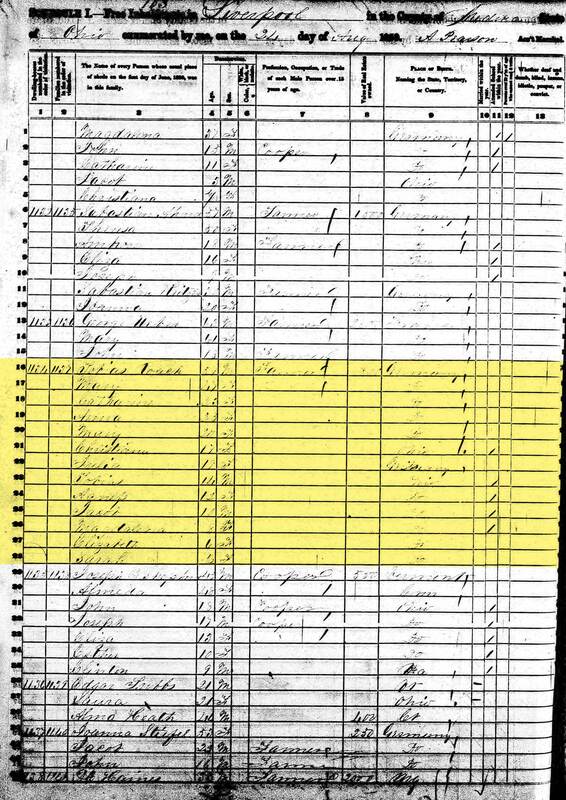 4 "United States Census, 1850," database with images, FamilySearch (https://familysearch.org/ark:/61903/1:1:MXQP-Q5D : accessed 3 July 2015), Tobias Rouch, Liverpool, Medina, Ohio, United States; citing family 1137, NARA microfilm publication M432 (Washington, D.C.: National Archives and Records Administration, n.d.). 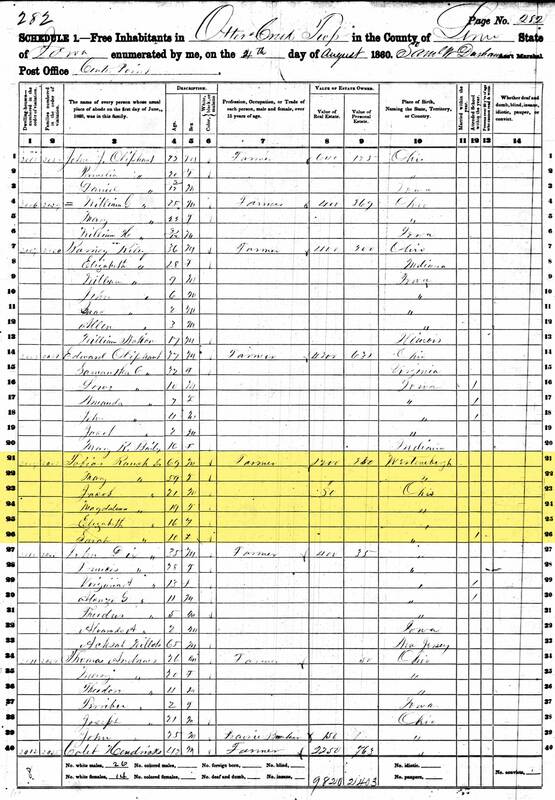 7 "United States Census, 1860," database, FamilySearch (https://familysearch.org/ark:/61903/1:1:M82P-T5X : accessed 3 July 2015), Tobias Rauch, Otter Creek Twp, Linn, Iowa, United States; from "1860 U.S. Federal Census - Population," database, Fold3.com (http://www.fold3.com : n.d.); citing p. 282, household ID 2032, NARA microfilm publication M653 (Washington, D.C.: National Archives and Records Administration, n.d.); FHL microfilm 803,332. 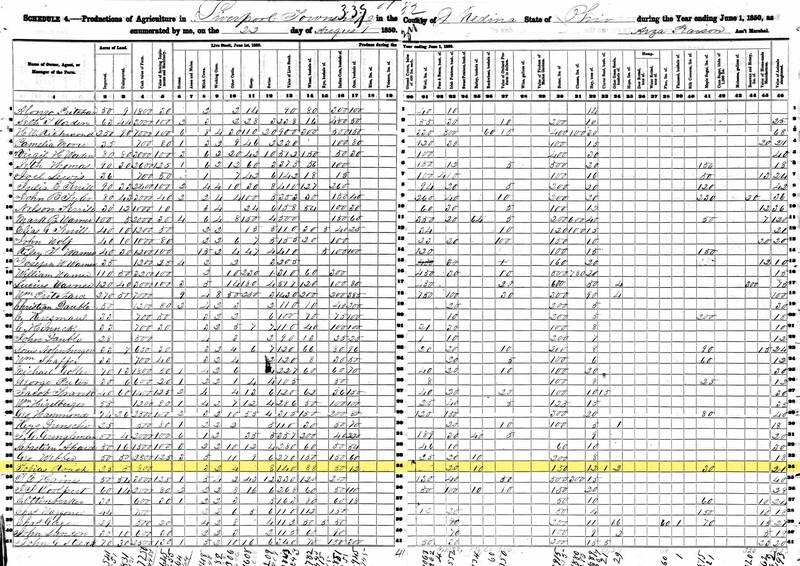 10 "United States Census, 1870," database with images, FamilySearch (https://familysearch.org/ark:/61903/1:1:MDVF-QST : accessed 3 July 2015), Dobias Ranch in household of Jacob Rauch, Iowa, United States; citing p. 26, family 179, NARA microfilm publication M593 (Washington D.C.: National Archives and Records Administration, n.d.); FHL microfilm 545,904. 12 Tobias Rauch in Taufen 1770-1866 in "Kirchenbuch, 1584-1876"; Evangelische Kirche Vöhringen (OA. Sulz) (Main Author), Manuscript/Manuscript on Film, German, Publication: Stuttgart : Hauptstaatsarchiv Stuttgart, 1990; 5 Mikrofilmrollen ; 35 mm, Family History Library, Salt Lake City, Utah; Film# 1732334, Page 100. Taufen (Baptisms) for 1793.